Are cat treats worth it? What defines a great cat treat? So how do we choose healthy treats? Treats are a great addition to your cat’s life. Isn’t there something fulfilling about watching your cat hop around, pupils dilated, paws flailing, maybe drooling slightly – as you withhold the treat for just a moment longer? For me, it’s those moments of anticipation that make giving treats to my cat so much fun. If you love sharing treats with your cat as much as I do, you know that treat time is a great opportunity to connect with your cat. Whether you use them as a tool during training or offer them as an impromptu snack during the day, treats can make life better. Just like human treats, there’s a wide range of options available for cats – you’re free to choose between true “junk” treats and those that are great for your cat’s health, but the options presented here are our choice for the healthiest cat treats available. As positive reinforcement. Since cats are so strongly motivated by food, a treat is often the perfect form of positive reinforcement for desired behaviors. If you want to tell your cat that you approve of their behavior, a treat is the perfect way to send a message when they jump off of the counter or use a scratching post instead of the couch. As a motivator and reward during training. Treats are an essential component of training your cat to come when called, sit, shake paws, or walk on a leash. To entice your cat out of hiding. While sometimes it’s best to allow your cat to have their space, treats can help to lure them out. Similarly, even if your cat doesn’t always come to the sound of their name, they’ll usually come running whenever they hear the treat bag shaking. To distract your cat during grooming and other uncomfortable situations. If your cat dislikes being brushed, having their ears cleaned, or getting their claws trimmed, treats can help to distract them from what’s going on. To help you select the right treats for your cat, I’ve sketched out a picture of the ideal treat. After identifying the characteristics of a great cat treat, take a look at my picks for the top 5 healthy cat treats for your feline friend. Above all else, cat treats have to be delicious. If it’s not exciting, it’s not worth it! Besides being tantalizing, a great treat must be nutritious. The best treats are the ones that don’t just make your cat’s day more fun – they’re good for them. Whether your cat prefers freeze-dried raw treats, soft baked treats, or crunchy ones, the same rule applies: simple is best. Cats are carnivores and don’t need long ingredient lists to stay healthy. We’re looking for minimal processing and maximum nutrition. Ideally, you should choose high-protein treats with no added sugar, grains, or artificial ingredients. But for a treat to make it onto our top 5 list, it has to check more boxes than just simplicity and appetite appeal. This list of the top five best cat treats will only include treats made with high-quality ingredients. They’re all proven cat-pleasers that are at once palatable, super nutritious, and easy to feed. It’s also important that these treats are low-calorie, so that you can feed them daily without worrying about your cat’s weight. Because all cats have different preferences, I’ve included treats from the following three categories: raw, crunchy, and soft. For the purist – these are simply morsels of freeze-dried raw chicken breast. For an obligate carnivore like your cat, there are few things better than raw meat. The freeze-drying process simply dehydrates the meat, leaving the texture, structure, and nutritional properties of the chicken intact. Cats love these carefully-sourced raw treats. Here’s another freeze-dried raw treat that appeals to your cat’s carnivorous nature. These treats are made from a combination of chicken, turkey, and wild-caught monkfish. Highly appetizing dried fish flakes that can double as a food topper. Bonito flakes are super-appetizing (and healthy) dried fish flakes. These hearty flakes are high in protein, low in fat, and offer beneficial fish oil. Because cats love the smell and taste so much, these flakes are often used as an appetite stimulant and food topper. Cats tend to go nuts over these! For the the cat who likes to crunch. 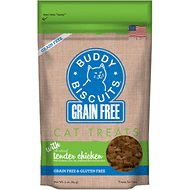 For cats who like healthy crunchy treats, these real chicken cat treats are a good option. These treats feature real chicken as the first in a short list of natural ingredients. As they’re grain free with no corn, soy, or wheat, these treats are perfect for cats with allergies. These small, tender cat treats are the perfect size for kittens and adult cats alike. These are pea-sized soft treats made with zero grain, gluten, or artificial ingredients. Because they’re so small and soft, they’re perfect for kittens and cats who have difficulty chewing. Any treat can make life more fun. Taking a moment to give your cat a treat they love is a way to bond with your cat anytime. We can use treats to communicate with our cats during training and as a reward for good behavior. Treats help us to distract, calm, and generally help improve our cat’s lives. But not all treats are created equal; and certainly not every treat is a healthy choice for your cat. In this article, we’ve taken a look at some of the best treats in a variety of different categories: raw, crunchy, and soft – and identified what makes them a great addition to your cat’s diet. Ultimately, it’s all about finding a treat that lights up your cat – one that absolutely thrills them every time they hear the sound of the bag shaking. Hopefully, this article has brought you closer to finding a nutritious treat that your cat will go nuts over. Once you’ve nailed down your choice of treats consider rounding out a top-notch diet for your cats with our suggestions for the best cat food of 2019.